If running in the rain was the only recipe for an illness, then people in the perennially-wet Pacific Northwest would be stuck training on treadmills for most of the year. Fortunately, that's not the case, and running in the rain is not necessarily going to make you sick. There are risks to running in the rain, but with proper precautions, you won't have to resign yourself to endless hours running like a rat in a cage. When it comes to viruses like the common cold, you'll contract them when you touch something that has a virus on it, and then you touch your nose, mouth or eyes. You'll also contract a virus from inhaling mucus through the air, suggests the National Institute of Allergy and Infectious Diseases. During the rainy months of the year, you're more likely to spend time inside, which will increase your chances of coming into contact with viruses. While there is no conclusive evidence that says running in the rain will make you sick, there are still risks involved with running in the rain. Studies have shown that lowering a person's body temperature may make them more prone to contracting viruses through the methods of transmission named above. In other words, it's the coldness, not the wetness, that may make you more susceptible to succumbing to a virus. In some areas, the rain may be caused by excess pollution in the air -- which could put you at risk of upper respiratory distress or an asthma attack. Rain also means wet conditions, which increases your risk of slipping and falling. Drivers are also less likely to see you in a rain storm, so the risk of getting hit by a car also increases. While that won't make you sick, an injury could sideline you from running. When temperatures are low, layers are key. Wear a wicking layer made of wool or polypropylene near your skin, which will wick moisture away from your body, and then wear an insulating layer over top. Your very top layer should be made of a water-resistant, yet breathable material. Totally impermeable rain slickers like the kind fishermen wear are not ideal, since they don't breathe. Wear a hat and water-resistant gloves, and consider wearing a backpack into which you can stash your insulating layers if you start to get overly warm. 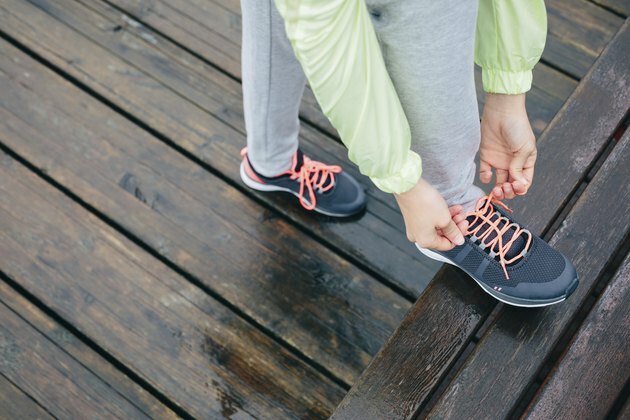 Running shoes are often made with compartments that allow lots of air flow -- but these are not ideal for sloshing through puddles. Consider a pair of trail running shoes instead, which are typically made with a water-resistant upper. If you're affected by asthma, check the local weather service for information on particulate levels, and don't exercise outdoors when the levels are higher than your doctor recommends for your condition. And don't skip the warm-up, which will get your body ready to tackle the obstructions, puddles and surprises that come with running in wet weather. To minimize the potential for illness or injury, keep an eye on the local radar and try to run when the rain is going to be lightest. If you're running a race or you have to run in a downpour for another reason, set yourself up to get out of that wet, cold clothing as soon as possible. Stash dry clothing in a plastic bag and put it in your running backpack or in your car, where it will be ready for you right after the race. Your best judgement is key here; if the rain is so bad that you're going to be soaked in a matter of a few minutes, chances are your body temperature is going to drop too low to make running outdoors worth the effort. Vanderbilt University: Can You Really Catch a Cold From Going Outside with Wet Hair? Medicine and Science in Sport and Exercise: American College of Sports Medicine position Stand: Prevention of Cold Injuries During Exercise.